Women's small (medium, large), to fit 7 (8, 9) inches/18 (20, 23) cm foot/leg. Stensöta is the swedish name for Polypodium vulgare, a fern that is commonly found in central Sweden where I live. Stensöta grows between rocks and old walls, with long fronds and sori on the back of the fronds. The name comes from how it grows between rocks and walls (sten is stone in swedish) and that it has a sweet taste similar to sweet licorice (söt means sweet in swedish). 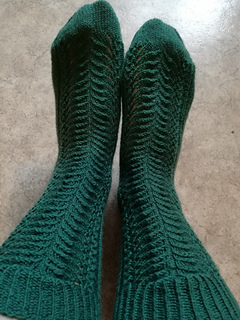 The socks are knit top down with a twisted rib cuff, traditional slip stitch heel flap and gusset. The lace design features a lacey fern motif with eyelets and mock cables. Materials : Bugbear Woolens Gemstone Sock Yarn 75% superwash merino, 25% nylon, 463 yards (401 meters) / 100 grams. Needles: US 1/ 2.25 mm, your choice of dpns, two circulars, or one long circular to work in the rnd. Gauge: 32 sts, 44 rnds = 4 inches (10 cm) over stockinette stitch in the rnd. Size: Women’s small (medium, large), to fit 7 (8, 9) inches/18 (20, 23) cm foot/leg.